Modules require individual attention to work at their best individual capacity, just like people. Only if a module receives the optimum specific combination of voltage and current will it work to achieve maximum performance. Through both technical discussion and the analysis of real-life data, this paper will demonstrate how additional energy can be gained from solar PV systems when applying power optimization at the module level. Mismatch occurs when modules in an array do not exhibit fully identical electrical properties or when they are exposed to different environmental conditions. In fact, mismatch is a natural state existing between PV modules from their outset. It is common knowledge that each module provides maximum power (Pmpp) at a different combination of current (Impp) and voltage (Vmpp). The same current runs through all the modules in string, irrespective of their MPP. Acting as central units, traditional inverters are by definition unable to single out the individual IV curves of modules, let alone adjust current and voltage per module. Instead, traditional inverters track the maximum power point collectively for an array of modules . By taking a “one-size-fits-all” approach traditional inverters compromise on receiving an average system output in which weaker modules hamper the output of stronger modules in the array. The energy that is lost as a result, can commonly be referred to as module mismatch loss. The assumption that mismatch could be avoided by creating and maintaining absolute conformity between modules throughout the entire system lifetime, seems rather impractical given the fact that even after being flash tested and sorted according to similar IV curves (power curves), a standard deviation of ±3% from the modules’ nameplate capacity remains. From this point, mismatch can be aggravated by virtually anything that evokes a difference between some modules in an array. due to dirt on the modules => 3-6%. Module-level MPPT adjusts the current and voltage to the specific requirements of each individual module and guarantees that modules work at their maximum capacity regardless of other modules in the string. As opposed to an average, module-level MPPT means harvesting the sum of all peak operating points of modules which by simple mathematics principles, will always result in greater energy yield than harvesting an average. 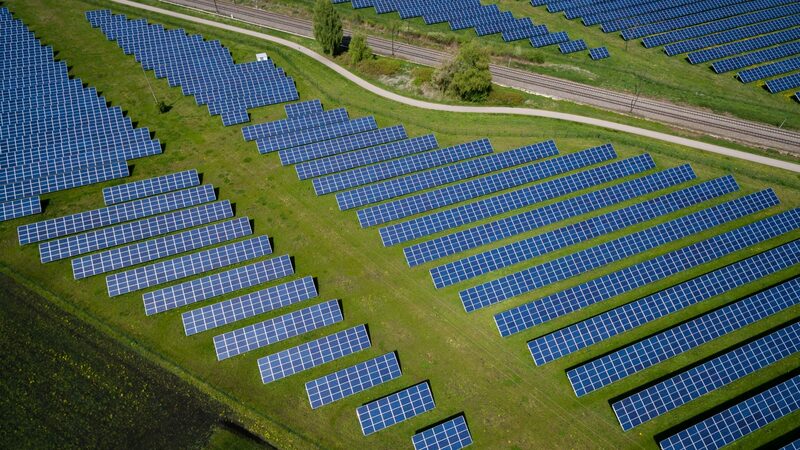 SolarEdge with its optimized production configuration reduces losses due to various output power of photovoltaic modules, partial shading, dirt on the modules and modules with different ageing. The MPPT per module allows for flexible installation design with multiple orientations, tilts and module types in the same string. 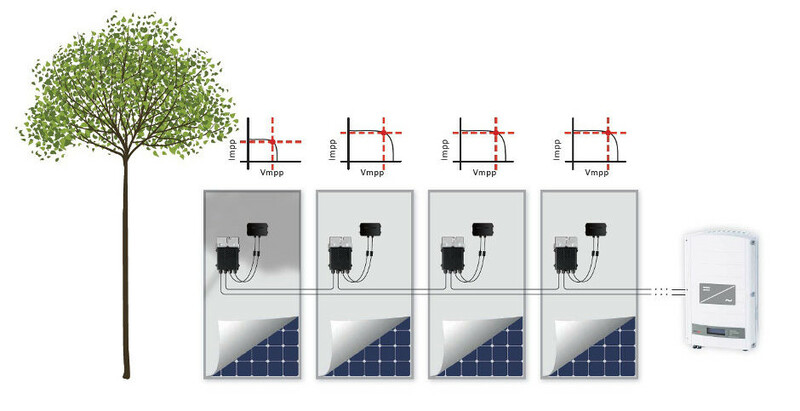 When working with SolarEdge Inverters, SolarEdge power optimizers automatically maintain a fixed string voltage, allowing installers even greater flexibility with longer strings and strings of different lengths in order to design optimal PV systems. 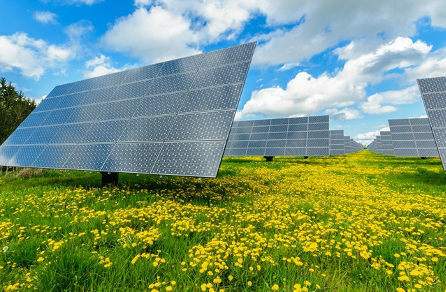 The SolarEdge power optimizers are DC-DC power optimizers that perform MPPT per individual panel while monitoring performance of each panel and communicating across existing power lines. Moreover, power optimizers always maintain a fixed DC string voltage, allowing optimal efficiency of the SolarEdge PV inverter, which is tailor made to work with power optimizers. As a result, the SolarEdge system provides more power from any given installation, eliminates design constraints, provides complete panel-level and whole-system visibility for monitoring and maintenance alerts, resolves all safety hazards, and provides anti-theft mechanisms, all while reducing energy costs. On the same inverter it is possible to connect two different lengths of strings, which facilitates our planning. Within each set we can attach from 13 to 50 modules up to 11.25 kW per string.